From award-winning author Amy Ehrlich comes an illustrated biography of Willa Cather, one of America’s greatest and most beloved writers. Willa Cather’s life was a true American success story. A pioneer and determined spirit, Willa didn’t let anything stand in her way. She refused to be discouraged by the fact that in the 1880s women hadn’t written before, because she had many ideas to share. By becoming a trailblazer and following her heart, Willa Cather is remembered today as one of the greatest American writers in history. Filled with captivating and historically accurate details, as well as gorgeous illustrations by Wendell Minor, this illustrated chapter book is ideal nonfiction for middle graders. Amy Ehrlich is the founding editor of Candlewick Press, and the award-winning author of many books for children, including Leo; Zack and Emmie, illustrated by Steven Kellogg; The Day the Goose Got Loose, illustrated by Steven Kellogg; and most recently Rachel Carson, illustrated by Wendell Minor. Amy is also the author of Where It Stops Nobody Knows, a Booklist Book of the Year, and Joyride. She lives in Vermont with her family. In this concise biography of Willa Cather (1873–1947), Ehrlich (With a Mighty Hand) focuses on the profound impact the author’s youth had on her writing. Portrayed as idyllic and ever-changing, Cather’s early life in Virginia contrasted sharply to the barren Nebraska prairie where she moved, at age nine, and initially thought “she’d come to the end of everything.” Fortunately, Cather quickly came to revere her fellow settlers and later incorporated their experiences and her love of the open space into her best-known novels. Throughout, Ehrlich makes good use of engaging details (children “built campfires on the beach and told stories and watched the flickering stars”) and imagery (“it was as if her personality and the world she had known were being erased”). Occasionally abrupt changes of time and place result from Ehrlich’s telescopic narrative of the half century Cather lived in East Coast cities, but she concludes with a satisfying assessment of the author’s literary achievement. Minor’s sepia and color paintings bring a warm sense of place to the urban and rural settings, and a timeline and appendix of female writers of Cather’s time are included. Ages 7–10. Ehrlich pieces together the life story of Willa Cather in this short illustrated biography. The narrative is divided into segments that follow the travels of Cather and her family, beginning in 1877, in her childhood home in Virginia. Brief chapters cover her family’s move west to Nebraska and a bit of her adult life in New York City. Cather is shown to be inquisitive and thoughtful; she spent time with pioneer women and read adventure tales. The author stresses Cather’s circumstances, her desire to escape her community’s shortsighted expectations of girls, and the importance of writing as a passion and an outlet. Ehrlich assumes a familiarity with the subject matter as she describes Cather’s life ... Back matter includes a time line of Cather’s life and work, as well as short profiles of 15 other women writers who were her contemporaries. Minor’s watercolor paintings and drawings give readers an idyllic rendering of the American West and post–Civil War life. VERDICT An accessible biography for elementary students learning about late 19th- and early 20th-century U.S. history. 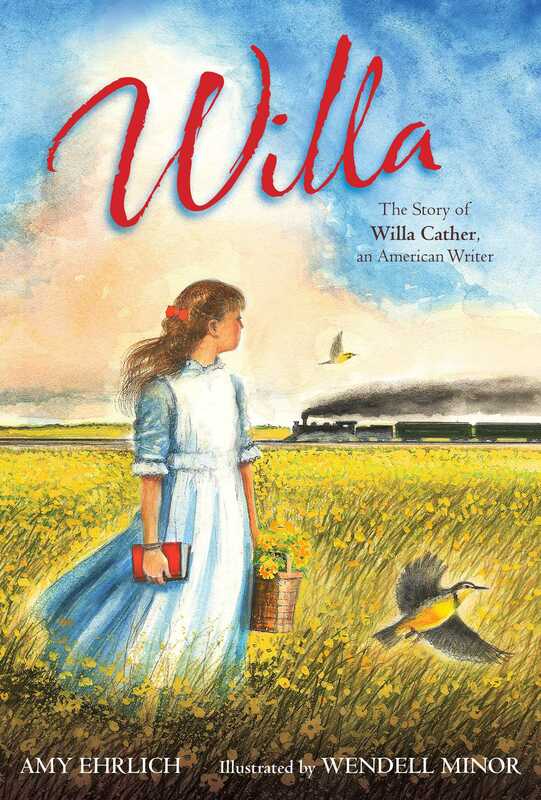 In this chapter-book biography of Willa Cather, elementary-grade readers may be lured by a story initially reminiscent of Laura Ingalls Wilder; Cather was trans- planted from the East (in this case, Virginia) to the Midwestern plains (for Cather, Nebraska), and later notably chronicled the experiences of pioneers during white settlement. Wilder’s writing is accessible to younger children, though, while Cather’s work leans toward an older audience, and it’s unlikely that Ehrlich’s intended reader will have encountered Cather’s work. Perceptive kids will glean the basics here—that Cather’s Western sojourn and acquaintances formed the basis of many of her novels, even though her own education and experiences were broader than this interest might suggest. Minor’s illustrations, some color, some monochromatic sepia-toned, offer stiff, literal images drawn from the text, a timeline extends the list of people Cather met, a bibliography is directed to adult readers, and fifteen thumbnail bios of noted American women writers.